Obama fired up students at two colleges yesterday. 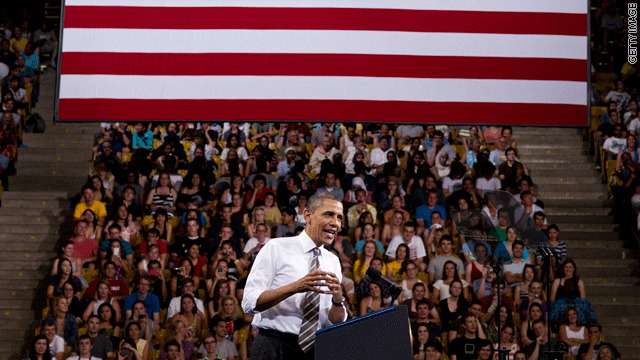 President Obama’s tour of college campuses continues Wednesday with a speech at the University of Iowa in Cedar Rapids. The remarks will be much like those he delivered yesterday at the University of North Carolina and the University of Colorado: an aggressive push for congress to keep student loan rates down. The speech, Obama’s first since rival Mitt Romney unofficially claimed the GOP nomination Tuesday night, will also feel less like an “official” event and more of a campaign rally. Still, while this latest foray is entirely to states that will play a significant role in November, the president is merely acting in his official capacities, not as a candidate. It’s a thin line to be sure. This campaigning on our dime needs to stop. It is against the law. I do not expect anything to change during this administration in this area at this point. Instead of forcing the crazy Obamacare bill on us this administration should have focused on tax reform and campaign finance when they had the majority if they really wanted "change". Improvements in these key areas would have fixed many of the problems in this country. "Hope and change" has changed to "can't do it, it's their fault". Hey John, one word for you, 'Fillabuster!" Look it up. It was used more times than any other time in history. The Republicans successfully used the tactic to stall or kill many of the initiatives that this administration tried to enforce. Also, I'd like to introduce to you the title, "Blue Dogs". Yes Sir, those confused, spineless democrats that only sought to be re elected in their republican dominated districts and therefore voted with the Republicans. This Sir, killed or stopped the ball of Hope and Change from gaining any real momentum. Ya see what a lil homework can do for you Johnny boy? Now go arm yourself with knowledge and stop parroting the four stooges of "Glenn/Sarah/Sean and Rushbo". Happy hunting. so i will go with the republican universal defense strategy, all of the other presidents did it too! The University of Iowa is located in Iowa City...not Cedar Rapids. University of Iowa is in Iowa City, Iowa not Cedar Rapids. Just a friendly heads up. Since Obama spends every day campaigning and fund raising ... instead of governing ... CNN actually publishes a story when Obama doesn't campaign for one day. The University of Iowa is in Iowa City, not Cedar Rapids. The University of Iowa is not in Cedar Rapids, it's in Iowa City.